A grant from the Hansen foundation combined with local fundraising support and county funding to get a 100-year old clock ticking again. 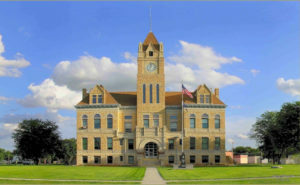 The cloc k, located in a historic NW Kansas courthouse, was old enough that there was no guide for the restoration team. The company used the existing parts as a pattern for the new mechanisms, and replaced the original wooden hands. No excuse for being late now, the whole town can see the time!